The Houstonian offers extraordinary tranquility and exceptional resort amenities and services, yet it is only minutes away from the Galleria and numerous businesses. The expansive lobby with its towering two-story stone fireplace clearly conveys the mood of the Houstonian: comfortable elegance. Spacious rooms are funished with comfortable armchairs and oversized desks and are decored in warm, neutral tones. The on-site Olivette Restaurant serves breakfast, lunch or dinner with a Meditarreanian flair. The Gazebo offers pool side food and drinks from lunch until late evening. Guests have access to the Houstanian Club, a 125,000 square foot state-of-the-art fitness center with numerous free classes, as well at the Trellis Spa. Guests also enjoy preferred rates at two of Houston's best golf courses. Complimentary shuttle service is available for nearby locations. Each of the 288 rooms is beautifully appointed with comfortable seating and ample work space. Most rooms have floor-to-ceiling windows that overlook the landscaped grounds. All rooms have cable tv with movies and games. Standard rooms, 480 sq. ft, have either two queen beds or one king bed. The Concierge Level includes continental breakfast, evening cocktails, and after-dinner sweets and drinks. There are also executive suites and a Presidential suite. Guests can choose from three distinctive pools: the warm-water Zen pool; the exercise pool, with cooler water and lap-swim lanes; and, the resort-style pool, which features a zero-depth entry, a waterfall and a slide. The Gazebo, in the pool area, serves drinks and sandwiches. 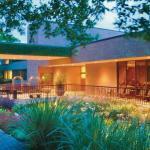 At the Houstonian Club, guests can jog, use machines or free weights, take classes or climb the rock wall. Healthy food and drinks are available at the Center Court Cafe. The Trellis Spa offers a wide range of treatments for men and women. Those who just want to unwind in their rooms will find plush terry cloth robes and spa-quality shampoos and lotions to help them relax, as well as a variety of room service dining choices.